Sivasdescalzo (SVD) is a Spanish based retailer. Previously their raffles were typically held through a bespoke online system but this has recently been moved to a dedicated app. This gave us the perfect opportunity to see what’s changed and how good it is at stopping bots, which the app was specifically designed for. The app itself is very well designed and it’s clear a lot of thought was put into the layout and the features within. When you first open the app you must sign in with an existing SVD account. Once you are in, you are greeted with an Instagram story like countdown slideshow for the most hyped raffles currently open and other various SVD releases. The bit we are interested in is the ‘raffles’ tab. On selecting, you are presented with a very clean and minimalistic list of the current raffles available alongside a share and ‘favourite’ function – which defeats the purpose as currently raffles are only posted if they are available to enter. Once you find a shoe you want, the exact details you need are presented (price and closing time) with the usual shoe description below. Entering is just as clean and simple with the options for online worldwide shipping and local in-store raffles being easy to distinguish so you won’t enter the wrong one. Similar to END, your shipping details are already selected and once you’ve entered your size and a form of ID (driving license or passport), you are entered! 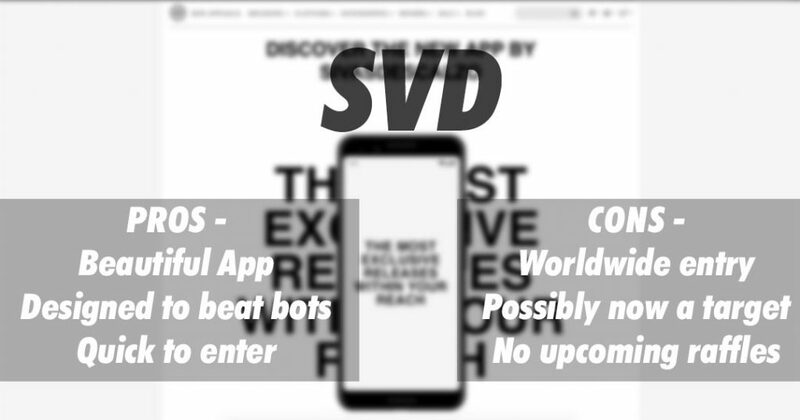 SVD has stated the app was designed to take on bots and multiple entries, and they have created a near perfect system for doing just that. This is achieved through using a UUID (basically a unique identifier), which is a 128-bit number used to identify computer systems. When you log in, your phone is assigned a UUID, locking it down to that specific device. If you log out of your current account and into a new account, you still have the same identifier, stopping you from entering with multiple accounts on the same device. Coupled with requiring to provide a form of ID, these two create one of the best systems for stopping bots and multiple entries. This means that for the local collection raffles your odds are exceptionally good, with people, in theory, being restricted to one entry. For the online worldwide raffle, even though the odds are very small for a worldwide raffle, this is certainly the fairest, and if the UUID system works, the best odds. Obviously, you could buy hundreds of phones to cheat the system but this is both time consuming and expensive compared to other bot methods. The lengths SVD have gone too to try and defeat the bots are extremely impressive. SVD has a clear aim to eliminate bots and make the entry for raffles as fair as possible with the development of this app. In terms of re-selling it appears SVD have no public opinions about winners selling their pairs. Although the system is new and we’re sure people are already working to find ways to defeat it, we can only applaud SVD for the effort and amount of investment that they have put into this new system. This is exactly the kind of thing we love to see retailers doing to help make the raffles fair for all. For this reason, we are going to give them the first 5/5 even though the worldwide raffle odds are obviously low, the innovation and dedication have to be commended. The only addition we would like to see would be ‘Upcoming raffles’ so you can see what’s on the horizon and coming soon however there is one for more general release shoes. We will revisit the app in a few months to see how it is holding up and if the bot developers have cracked the system. EDIT – Since writing this review SVD are releasing various hyped releases from last year. This has been the first time the app has been crashing for multiple people since launch, this is obviously due to the number of people flooding the servers similar to SNS’s problems. This is something that will hopefully be addressed. Enjoy reading this? Check out our other raffle reviews, or upcoming sneaker releases.